The stockings are hung, the tree is up, and on the front door hangs a wreath. Christmas sights and sounds fill the air, as well as delicious smells from Christmas treats. December is here and it is time to celebrate the holiday season! Last year I celebrated in a big way and had a countdown to Christmas. I featured 12 days of fun and seasonal recipes leading up to Christmas. While most blogs and sites are featuring recipes for cookies and fudge this time of year, I opted to feature 12 days of Christmas breakfast ideas! I am continuing this tradition this year, but because I went slightly mad last year (no seriously ask Eric) with all the last minute craziness the last few days leading up to Christmas, I decided to do a 12 days of Christmas this year (the first 12 days of the month), and not a countdown to Christmas. This also allows you to actually have these recipes to plan and use for Christmas morning. Although, all of these recipes I will share will make for a beautiful Christmas morning breakfast or brunch they would really be good any morning this time of year or just about anytime you need a good breakfast. One thing I love for breakfast is a nice flavored oatmeal. But I never thought to take that traditionally sweet breakfast meal to the savory side. But the fact is I loved it. 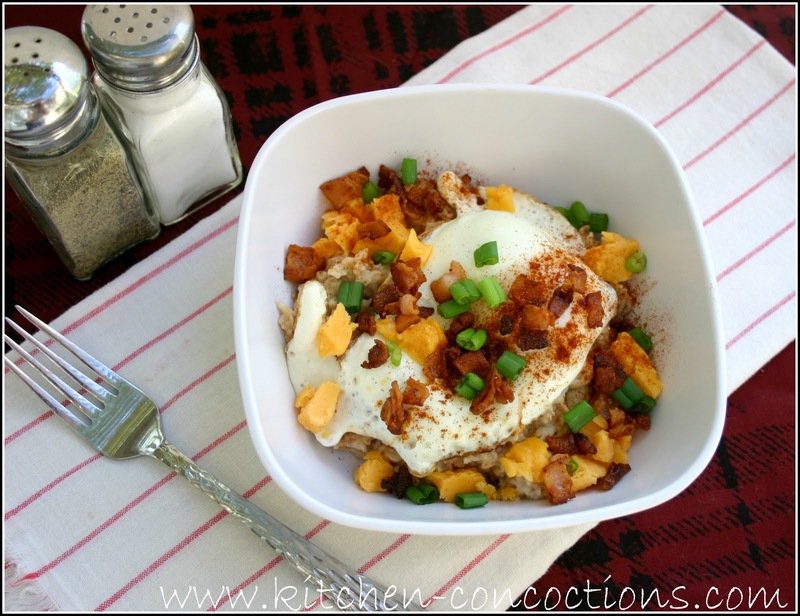 The oatmeal gives this meal some umph, while the salty bacon, smoky paprika, rich cheese, and a nice ‘sauce’ from the egg yolk makes this one flavorful, hearty breakfast. In a small saucepan, bring 1 cup water to a boil. Add oats; stir, reduce heat, and simmer until tender, about 5 minutes. Meanwhile, heat a small nonstick pan over medium. Add bacon and cook to desired crispness. Remove bacon and drain most of the grease. Add egg and cook until white is set and yolk is still runny, about 3 minutes. Season egg to taste with salt, pepper, and paprika. 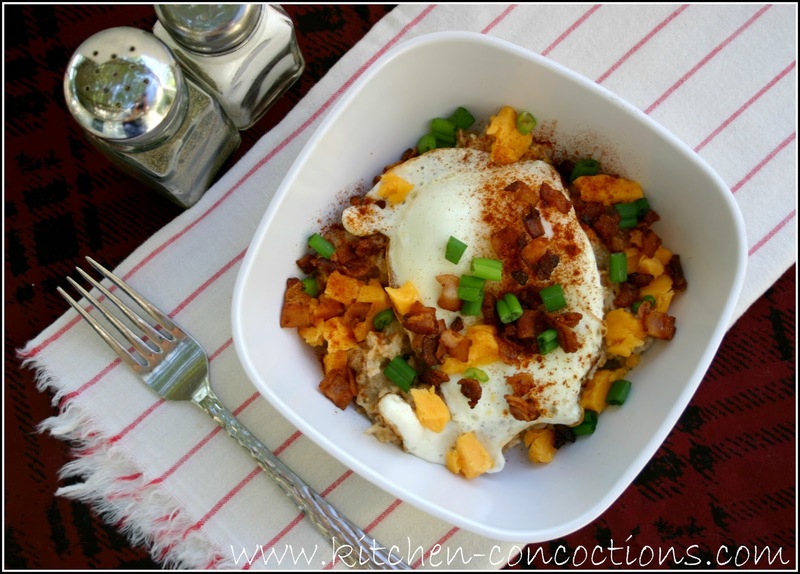 Serve oatmeal in a bowl topped with cheese, egg, bacon pieces and greens onions. Note: This meal can be easily doubled or tripled.